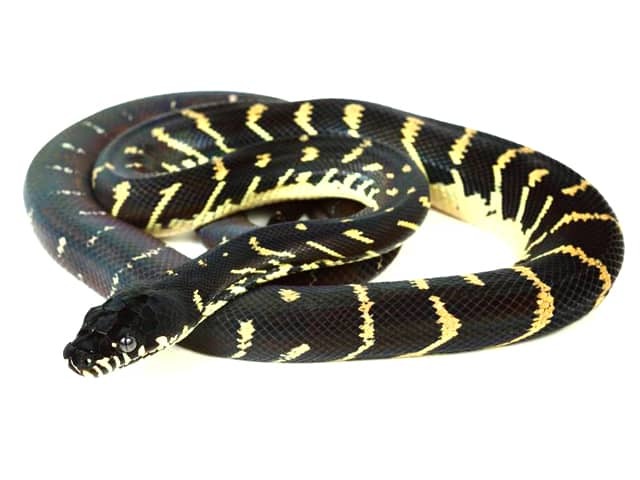 Adult Simalia boeleni exhibit a breathtaking jet-black coloration. When the sun hits the iridescent body just right, the snake appears bejeweled with an array of intense blues and purples. Yellow, forward-facing bands breach the face and underside. Babies are a pristine burnt-red to orange, and their bodies are covered with yellow to cream bands. As Simalia boeleni mature, the reddish body turns black, though some form of the bands remain. The upper and lower lips are also patterned with pale or whitish labial scales. The black portions are commonly iridescent with an oil-slick like sheen. The body is stocky and the head large. A standard size enclosure such as rubber made containers etc. around the size of 0.6 x 0.6 meters (2 x 2 feet) to house hatchling and juveniles. There are no sharp corners to injure there fragile little bodies so it helps eliminate the risk of possible injury ( nose rub, body lacerations etc). I also encourage the incorporation of small smooth dowel rods that will serve as a perching area and climbing surface for the little guys to interact with. PVC is the best because it can be properly disinfected. As the animal continues to grow increase enclosure size. Snakes in the 0.9-1.2 meters (3-4 feet) range can be kept in enclosures measuring 1.2 meters long by 0.7 meters wide by 0.45 meters tall (4 x 2.3 x 1.5 feet). I would not recommend adult animals to be kept in anything smaller than a 1.8 x 0.9 x 0.6 meters enclosure (6 x 3 x 2 feet). There are several manufacturers of very nice large snake cages that can easily accommodate your needs. Setting up juveniles housing video. For juveniles a small hide box filled with lightly moistened sterile sphagnum moss. This will give the snake a chance to coil up and feel secure in a nice tight spot as well as assist with proper humidity levels. As the snake grows the hide box should get bigger in order for the snake to fit inside and feel secure. Substrate of newspaper works great to monitor fecals and replace with no issues. The substrate in an adult’s enclosure can be as simple as newspaper or butcher paper. Using either will make it a breeze to collect fecals, and they are inexpensive and readily available. Cypress mulch is another alternative; however, you run the risk of the snake getting some of it in its mouth, and this type of mulch can be rather rough on the scales, too, if it’s allowed to dry out. So just keep a watchful eye. Use a full-spectrum ultraviolet light to maintain a cycle of 12 hours of light and 12 hours of darkness. Always provide a good UV source, as ultraviolet light is very important in order to successfully maintain these pythons. Boelen’s pythons are exposed to high levels of ultraviolet light in the mountains of their natural range. For Neonates I utilize an under-tank heating pad to maintain an enclosure temperature of 23-29 ºC (74-85 ºF). Keepers can certainly use a over tank heating element with a small wattage basking bulb to provide a basking site as well. Care must be taken not to over heat the animal. The air inside the enclosure should be humid but not stagnant. If using a tub style container punch small holes around the upper rim of the plastic container to allow for some air circulation. When the snakes are the size of 0.9-1.2 meters(3-4 feet) they will be exposed to my adults husbandry parameters such as cooler nights and warmer basking access such as temperatures of 35 ºC (95 ºF). Nighttime temps can drop into 20-22 ºC (68-72 ºF) . The issue to consider is temperature gradients and proper temperature access at this point. Adult snakes will enjoy a basking area of 38 ºC (100 ºF) as long as they have plenty of room to reach cooler areas of the enclosure. Cooler temperatures in other areas of the habitat may range of 18-20 ºC (65-68 ºF). For juveniles there should be a shallow water dish placed way from any heat source and changed daily with fresh water. For adults snakes a large bowl of fresh water should be made available to your snake daily. Humidity at the peak of the day should be in the 70- to 80-percent range. Neonates and adults are misted daily in order to sustain proper humidity levels. Boelen’s pythons love to eat. Be cautious about overfeeding them, because they are so eager to accept food and will enthusiastically greet you at the front of their enclosure, expecting to be fed every time you approach it. In the wild, neonates and juveniles will feed on small rodents, bats, lizards, fowl and small frogs. As they grow, they will eat larger ground-dwelling rodents, birds and cuscus, a marsupial that is found throughout New Guinea. There are also reports of Boelen’s pythons climbing into trees to eat lorikeets, as well. Boelen’s can be fed appropriately sized rodents once a week if they’re neonates or juveniles, or every eight to 10 days if they’re adults. Other prey items, such as quail and small rabbits, may also be utilized. I encourage that you interact with your snakes. This type of familiarity with your scent will make it easier to service the enclosure or exhibit, as well as when you need to examine the animal. I would not engage in a prolonged handling session but I do recommend trying to remove the animal or animals on a weekly basis to accustom them to a routine. Spot clean in the vivarium daily. Completely clean and disinfect once a month unless it is in need of a good clean. 10% bleach to 90% water is a good solution for cleaning the vivarium, Wash with water and allow to dry before returning everything. Care must be taken to not super-saturate them, as you certainly do not want any kind of skin infections or fungus to result.